Ghosts I, Are They the Same as the Dead? This post is the first in a series that explores how ghosts differ from the dead, the fascinating nature of ghosts, and what to do to free them. I will be using examples from ghosts I have known and loved which I have had the privilege of liberating. In the popular imagination, ghost are usually regarded as dead people who for some reason cannot leave the “earth plane.” Is this true? I’ve worked a lot with ghosts and even more with the dead and I can tell you that there is literally a world of difference. First of all, a ghost is stuck in our dimension whereas the dead are already out of it. There are deceased who sometimes get stuck, either trapped in a delusion of their own making or in an in-between zone because they refuse to believe they’re dead. Nevertheless, they are not stuck on this side of the veil. At the least they are at the threshold of the afterlife. But that’s a topic I’ll save for another blog. There’s a huge difference between a genuine afterdeath encounter and a ghost sighting. When you wake up in the middle of the night and see your dead grandmother standing by your bed, rather than inspiring fear, it will inspire euphoria. She will be illuminated to some degree, either emanating light from inside or bathed in a luminescence. No doubt, she will be smiling at you. Your grandmother has come for a visit, expressly to see you, to help you through a difficult time, to reassure you of her continued existence, but occasionally to warn you about something in the future. As it is now, messages from the dead are often simple. “I’m still alive and still watching over you. I will always love you.” In the future, when we learn how to communicate with the dead, they will be more complex. Still, these few straightforward words have an undeniable power and can change your life. Unlike your grandmother who shows up wherever you are, ghosts are not there to pay visits. Instead, they are associated with a specific place. If they are aware of you at all, they will avoid contact, preferring to stay in their own isolated universes. And they don’t emanate light, but are wispy, appearing as something like smoke. And they don’t produce euphoria in their beholders. Fear maybe but never any joyousness. Your grandmother’s focus is entirely on you. 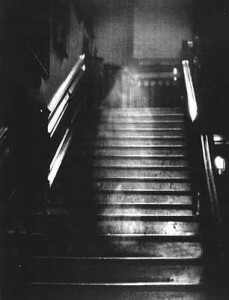 Ghosts, by contrast, have no intention of interacting with you or with the physical environment you see them in. They are therefore typically mute and unresponsive. In fact, getting their attention is hard work. They are also compulsive and self-involved. Ghost sightings usually involve a specter caught in habitual, repetitive, trance-like movement, like a perpetual re-run. For example, you might see them going up a staircase approximately at the same time of day or through a wall where a door used to be. The dead never do this. Instead, what they do is spontaneous and comes as a surprise. In Ghosts II, I’ll tell you why they are so different. Take a look! Can Science Prove Life After Death? Is There an “Animal Heaven”? Was That a Ghost or My Dead Uncle Harry? Should Science Have the Last Word on the Afterlife?